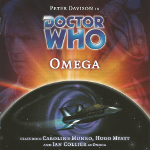 A strange telepathic message prompts the Doctor to travel to the 'Sector of Forgotten Souls', a place where, thousands of years ago, Omega's ship vanished whilst detonating a star. He's not the only one journeying towards it. 'Jolly Chronolidays' prides itself on giving its tourists an experience of galactic history that is far better than mere time travel. Its motto is 'We don't go into history, we prefer to bring history to you'. …suddenly it's not just a motto anymore. And Omega - and his madness - is closer than they think.